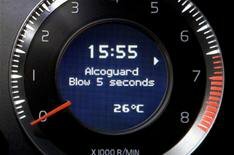 Volvo XC60 gets breathalyser key | What Car? Volvo's Alcolock breathalyser system will be available in the UK by the end of the year. It is the first time this kind of system has been offered to car buyers and works by analysing a sample of the driver's breath, which must be blown into a wireless hand-held unit before the car will start. The results are transmitted by a radio signal to the car's electronic control system. The car will not start if the driver fails the breath test. It will be available as an option first on Volvo's new XC60 before making it available for the rest of its range later. The option is likely to cost between 500 and 600. Volvo stresses that the system is only intended to help drivers make safe decisions, rather than regulate against drink-driving and is especially targeting the safety device at fleet managers who want to protect their company car drivers. A safety expert from the company said: 'We can't hide from the fact that a lot of fatalities involve a drunk driver and it's not usually the drunk who is killed.